Costa Concordia Salvage Operation To Begin Monday : The Two-Way A complicated salvage operation is set to begin Monday at the site of the Costa Concordia, the luxury cruise ship that ran aground off Italy in 2012. Even if it succeeds, it will be a long time before things return to normal on the island of Giglio, where the ship wrecked. Work at the wreckage of the Costa Concordia continues through the night Sept. 14, off the Italian island of Giglio. The Costa Concordia is due to be righted, in a project set to begin Monday. A complicated salvage operation is set to begin Monday at the site of the Costa Concordia, the luxury cruise ship that ran aground off Italy in 2012. Even if it succeeds, it will be a long time before things return to normal on the island of Giglio, where the ship wrecked last January. "The option of breaking up the ship on site was discarded because the shipwreck lies in the Tuscan marine sanctuary, Europe's biggest, a haven for whales, dolphins and the last surviving monk seals." Sylvia also reported on the undertaking for yesterday's All Things Considered, when she said that the ship's "carcass is like an alien from outer space that plopped down alongside the wooden dinghies moored in the small fishing port." That port has seen big changes since the Concordia crash that resulted in 32 deaths. While the hulking wreck has harmed the tourism business, hundreds of engineers, salvage divers, and other workers have converged on Giglio. 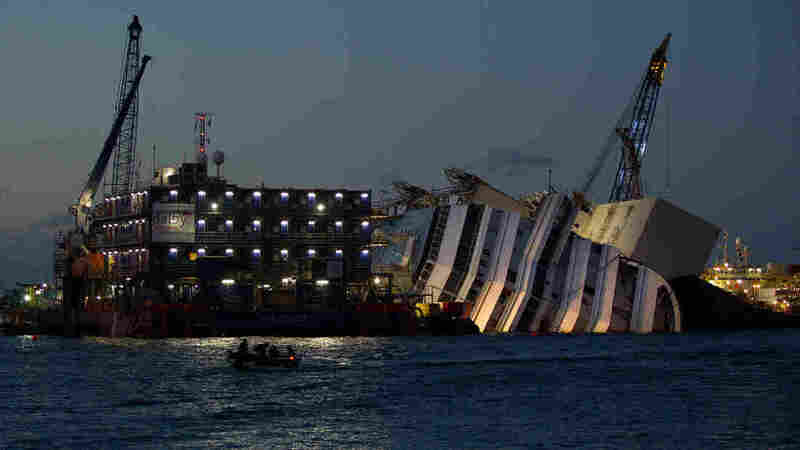 The salvage operation is being undertaken by an American company, Titan Salvage, and an Italian contractor, Micoperi. The operation has its own website — called The Parbuckling Project — which details the steps in attempting to stabilize and re-float the Concordia. "On any given night of the week, the portside bars are filled with men in gray Titan Salvage jumpsuits. An occasional salvage woman joins the mix, but the vast majority are men who come in to port to unwind. Some wear holsters with scissors hanging on them — a cowboy-esque equivalent of a pistol for deep sea oilrig divers. Others sling their red inflatable Titan-Micoperi life vests over their shoulders or dangle them on the barstools."